We are seldom more creative than when imagining the future. We like to dream, we like to dream big—and sometimes engineering and science makes those dreams come true. Take Leonardo da Vinci for example. Often the contraptions he drew, such as the famous helicopter-like “aerial screw,” were impossible to create, especially considering the materials and technologies available at the time. But almost 400 years later, we have the helicopter—in no small way thanks to the inspirational imagination of the great Leonardo. More recent generations have also imagined how people would move from place to place in the future—the future we all now inhabit. Some came true to varying degrees, some we still dream of making, others were simply…wide of the mark. 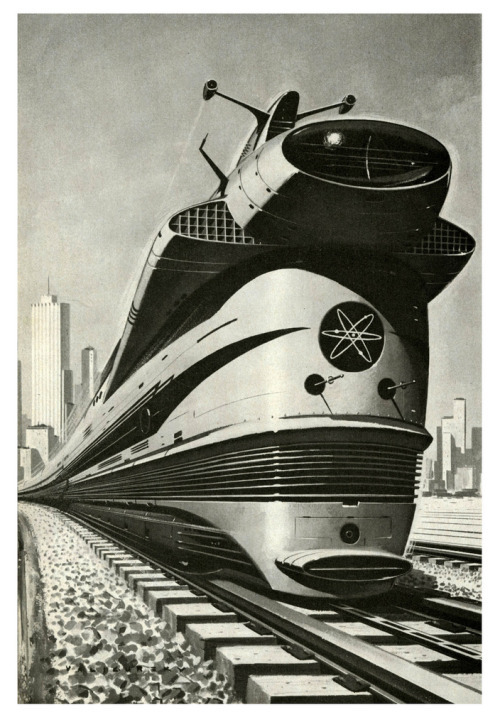 Below is a collection of images of curious transportation dreams and predictions from the last 125 years, including a look at whether or not we have turned those dreams into reality. Description: In more ways than one, Daedalus probably didn’t realize what he was starting when he began building wings for himself and his son. Since then—or more likely from long before the days of ancient Greece—mankind has dreamed of donning wings like the birds. 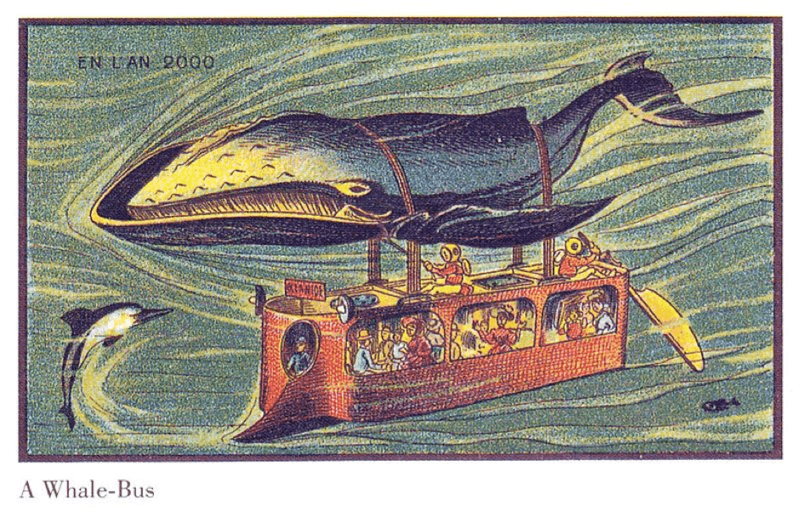 This includes the French artist Jean-Marc Côté and a group of similar-minded artists, who around the beginning of the 20th century issued a series of postcards imagining life in the year 2000. 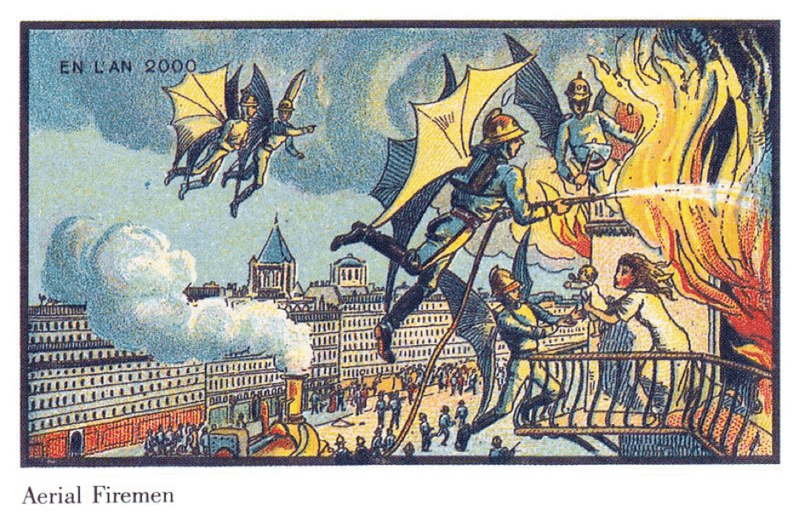 The series includes a number of flying devices such as the card above showing winged firefighters battling a fire and rescuing a woman and child. 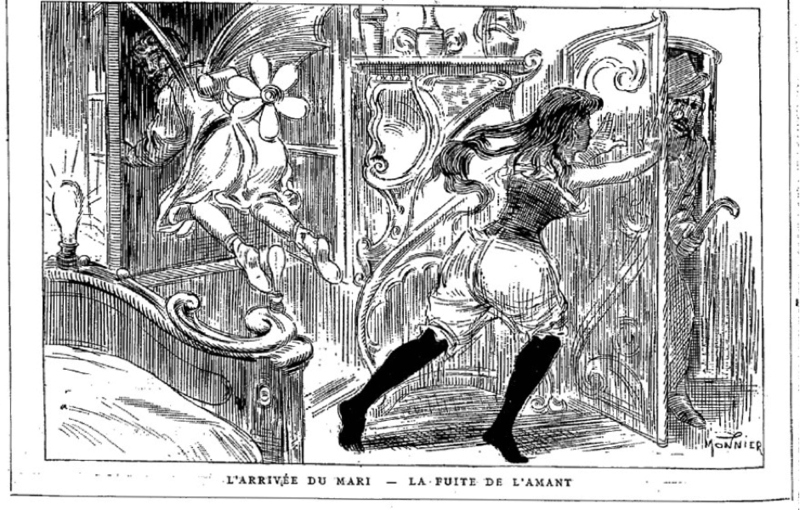 The idea of wings seems to have been in vogue in France at the time, as a second image, which might be a contender for the most French thing ever, illustrates. Did we make it come true? Sadly, the answer has to be no. We have strange festivals dedicated to jumping off platforms and seeing how far we can float along on the breeze and a couple of semi-successful attempts at creating human-powered wings. Apart from that, the idea of flying using nothing but wings still remains in the Icharian realm of imagination. An argument could be made that we’ve got the birds beat with hang gliders, but we are still talking static gliding (and the same goes for wingsuits). Ornithopters could be drawn in by the defense. Admittedly, some advances have been made, but to date all flights—whether human-powered or machine-powered—have been over such short distances and time spans that even the Wright brothers wouldn’t have been impressed. The stern judge scans the court, bangs his gavel, and rejects the claim. 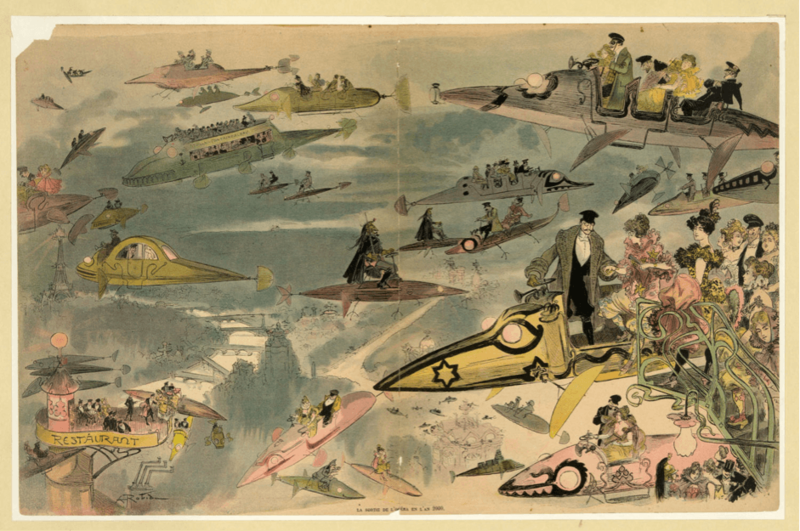 Description: The artist and illustrator Albert Robida’s great painting above of crowds getting ready to go to the opera in the year 2000 predicted that our skies would be full of floating/flying torpedo-shaped vehicles. While health and safety might have a thing or two to say about the design of these cars and buses of the future, scientists and science fiction fans are likely more interested in what means of propulsion they could be using. The vehicles seem capable of steady hovering/floating. Perhaps the dish-shaped ‘fins’ are a kind of repulsorlift, a la Star Wars. Another option would be that they are using some sort of magnetic levitation; but if so, then good luck to the soldier (dead center) holding on to his saber when another vehicle gets too close. A third possibility is the vehicles have hidden propellers, making them a kind of flying car or personal helicopter. In the case of magnetic levitation, then to a certain degree—although much closer to earth. The newest generation of Japanese trains powered by magnetic levitation are breaking all kinds of records, recently going past the 600 km/h mark. However, this is along a track, and they are only lifted a very small distance above the ground. The future of the technology looks promising, with some scientists speculating we could use mag-lev powered ramps to launch satellites and spacecraft into orbit. Repulsorlifts are, however (sadly), still imaginary. Sky cars are a pretty well-known concept that has seen some success. The best-known (and notorious) example might be the Moller Skycar, which also illustrates the main issue with flying cars. We might have achieved flight, but personal flying craft are simply too expensive and have too little proof-of-concept to gain any real practicality. Personal flying craft as a general category, however, could be hovering on the edges of success. Companies, including Pal-V, Zee Aero, and e-Volo are all working on prototypes. Description: The future was Jetsons-bright back in the 1950s when nuclear power seemed to be the likely answer to most of our future transportation needs. 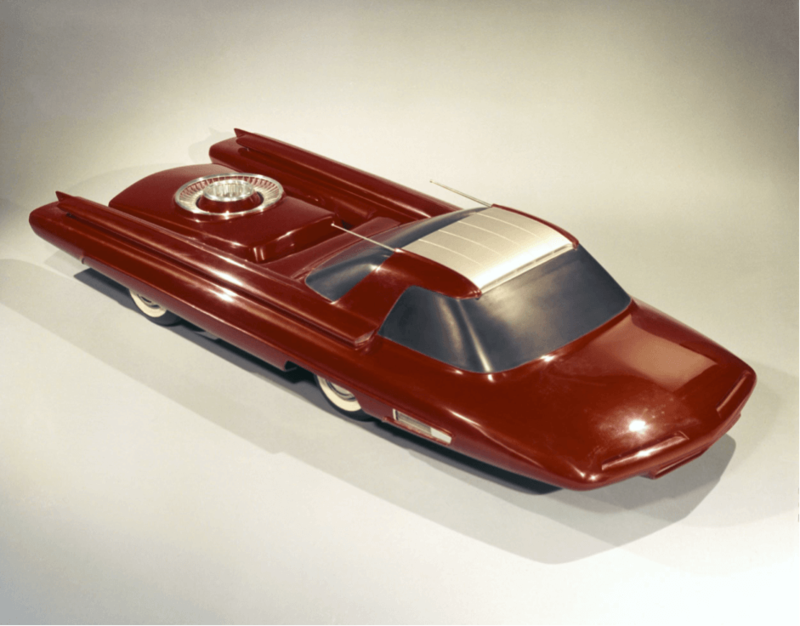 One example is the Ford Nucleon above, a concept car from the late 50s. The vehicle would be propelled by a nuclear steam generator placed in the back. Tailgating would have come with certain hazards, but the miles per gallon would have been pretty incredible. The army was also looking into getting some nuclear vehicles in the late 1950s—at least if Chrysler had continued with the TV-8. It is an atomic tank, which, in some illustrations, was equipped with a battering ram, as well as what looks like floating abilities. Though today it might look like it was invented in a parallel, militarized Haight-Ashbury, the concept was likely quite serious. Both the US and Soviet armies were experimenting with nuclear powered craft at the time, including both tanks and airplanes. Short answer: No. Micro nuclear reactors seem to be having a bit of a renaissance at the moment, though, so perhaps they could soon be shrunk down to a size where they could be used as propulsion for vehicles. However, that still leaves a really big question: How would you like to ride around with a small nuclear reactor in your car? Nuclear planes actually took to the skies in the late 1950s and early 1960s, but their potential strategic advantage—primarily being able to stay airborne over enemy territory for long periods of time—was negated by ICBM nuclear missiles, such as the Minutemen. Not really. We have tried to use marine mammals for various tasks, and the results so far seem mixed. Various stories abound about the US Navy program to train dolphins to locate mines There have been few reports of real success, but if this is due to the dolphins refusing to cooperate, that could be taken as further evidence of their intelligence. Description: Perhaps the notion of a plane that’s also a submarine sounds like something out of Jules Verne. However, it was the real-life passion and lifetime project of Soviet engineer Boris Ushakov. Ushakov’s idea began taking shape while he was an engineering student in the years leading up to the World War II. It caught the attention of the Soviet authorities, who authorized further feasibility studies. From the second half of the war on, Ushakov began building and testing his idea, including how it would do under water. Sadly, it never became a success, and in 1953, Nikita Khrushchev finally scrapped the project. Yes. In 1961, American Donald Reid began building a plane that would also be capable of movement under water. in 1964, he performed a full use-cycle, diving to 6.5 feet (2 m), before rising to the surface, taking off and flying at up to 33 ft (10 m) altitude. The concept could getting a serious upgrade quite soon. In 2008, DARPA announced that it was looking at making funds available for flying submarine research. DARPA being DARPA, they probably won’t tell us how it’s actually going. But like our ancestors, we can dream.